Eleven months after its release, Capcom's action-RPG Dragon's Dogma received an updated re-release in the form of Dark Arisen. In addition to giving a technical facelift to the original game, Dark Arisen boasts a brand new landmass to explore: Bitterblack Island. Reviewers seem to be mostly happy with these changes. Complaints have been raised about a few unfixed issues, but overall, Dark Arisen is said to deliver the Dark Souls-esque gameplay people expected from it, one way or the other. Here's what the reviews are saying. Dark Arisen contains the whole of 2012 release Dragon’s Dogma with a few welcome tweaks and a new high-level area and questline. It’s been marketed as an expansion, but it’s technically more along the lines of a director’s cut—the perfect version to buy for those who have never experienced the original, with some new stuff to draw in repeat buyers. At best, Dark Arisen only accomplishes half of that mission statement. The handful of minor improvements to the core Dragon’s Dogma experience give it a slight edge over the original release, but the new content isn’t plentiful or good enough incentive for a return trip to Gransys. Like almost any expansion Dark Arisen doesn’t entirely fix the flaws of the original. The combat still lacks weight and the visuals remain highly uneven – genuinely impressive one moment and horribly amateurish the next. As far as the expansion side of things go though Dark Arisen is impressively weighty and although the increased Dark Souls influence may wind some up the wrong way it does at least help to distinguish things from the original Dragon’s Dogma. What the original game did to make me feel [happy and excited] is still alive and well in Dark Arisen. It’s the big things, like the game’s outrageously fun battle system, where fighting back a random group of goblins in the ruins of a once-great castle can be as exhilarating as facing off against a gigantic beast of legend. It’s also the smaller things, like taking the time to stop and watch the sun rising from behind the distant horizon, appreciating the work that has gone into not only crafting Gransys on a technical level, but also making sure it feels active and alive. Dark Arisen's new area, Bitterblack Isle, offers many of the main game's delights, but it also tips the scales too far toward the "frustrating" end, especially in the final third of your sojourn. You reach Bitterblack Isle by speaking to a shimmering maiden who appears on the docks at Cassardis at nightfall. Her name is Olra, and she is still piecing together her memories of how she came to the dark, dreary island she transports you to. As you make your way through the dungeon's dank passages, a melancholy tale of love and loss forms, related by the groans of an unseen visitor and the etchings that you piece together on a monolithic memorial. Many of the items you'll collect in Bitterblack Isle are randomly placed, lending the game a Rogue-like flavour, and if you find any of the Isle's cursed gear you'll need to return to the shoreline where Olra can lift the 'curse' for you, revealing the item's identity and making it useable. As well as high-level weapons and armour, you might find new augments to add further skills to both your main character and pawn. This ensures the continued strategic development of your build, even if you've already put scores of hours into the game. 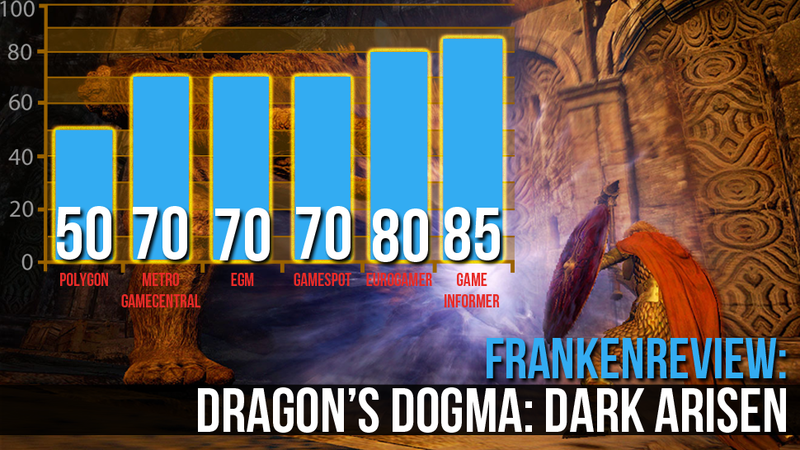 Dragon’s Dogma took its share of lumps for the way it handled fast travel, and Dark Arisen makes concessions in that department. There are now three fixed locations that players can warp to (compared with the one that players used the majority of the time in the vanilla release), which should alleviate some of those complaints. I enjoyed hoofing it across Gransys, and I felt that I was getting to know the place instead of just warping via a series of menus. If adding a few portals is enough to get more people into the game, however, I’m all for it. My encounter with one of the earliest bosses in the new content, dubbed ‘The Gazer’, is a good example of how I feel about Bitterblack. He’s a giant, floating, toothed beholder that I banged my head against over and over trying to defeat in the order the game was telling me to (avoid its gaze, knock out its tendrils until it exposes its eye, wail on it, rinse-repeat). I kept dying and dying, immensely frustrated, until I realized I could just climb on to an invisible wall inside its mouth (you know, the one full of rows of razor sharp teeth? ), and wail away more or less with impunity while hovering in mid-air inside its clearly horrendous, toothy smile. The Gazer fight is a perfect metaphor for Dragon’s Dogma: Dark Arisen — strangely balanced, frustratingly padded and begging to be defeated in the glitchiest and most counterintuitive of ways.